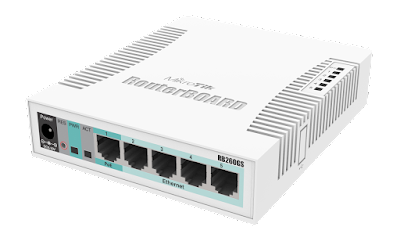 The MikroTik RouterBOARD RB260GS is a 5-port Gigabit managed switch which is powered by an Atheros Switch Chip. In addition to this it comes with SwOS, an operating system which is specifically designed for MikroTik products. SwOS gives you the basic functionality for a managed switch and is configurable from your web browser. The RB260GS has been tested and is recommended to be used with SFP modules: S-85DLC05D, S-31DLC20D and S-35/53LC20D.